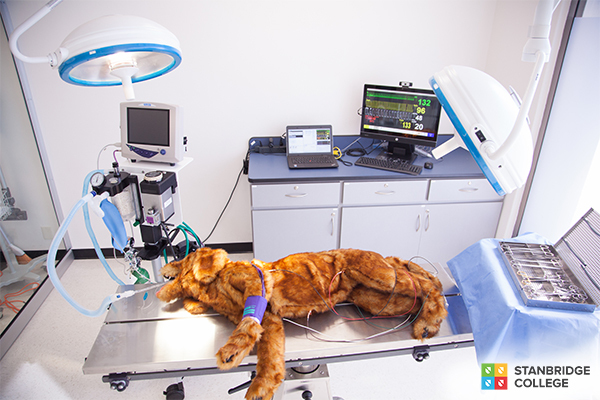 IRVINE, CA--(Marketwired - April 14, 2015) - Stanbridge College has added the world's first high-fidelity canine patient simulator for veterinary technician training to its Veterinary Technology Department. Dr. Daniel Fletcher, D.V.M, Ph.D., Associate Professor of Emergency and Critical Care of Cornell University's College of Veterinary Sciences, built the manikin as a training simulator for veterinary technician students. The simulator enables students to practice emergency response for canines with real-time physiological feedback as part of their clinical training. "I'm excited to have been able to help Stanbridge College build the first high fidelity canine simulator dedicated to veterinary technician training," said Dr. Fletcher. "Stanbridge has an outstanding simulation training program and is an excellent place to roll out this technology for veterinary technician training. I look forward to future collaborations with Stanbridge to investigate the effectiveness of this new method and to further develop this technology so that it can be made more widely accessible." "We are very pleased to partner with Dr. Fletcher and to have his skills assist in elevating our Veterinary Technology program with his newest innovation," said Mr. Yasith Weerasuriya, President of Stanbridge College. "Our goal is to provide students with world-class, hands-on training in as realistic a setting as possible to make their transition into their profession seamless. The canine patient simulator is groundbreaking and will give our students a competitive edge." "Stanbridge College is unique in that it offers a modern, well-equipped clinic on campus for its students to develop and master their technical skills," said Dr. Lawrence Kosmin, D.V.M., Medical Director of the Veterinary Technology Department at Stanbridge College and President-Elect of the California Veterinary Medical Association. "The addition of Dr. Fletcher's innovative training technology will allow our students to develop stronger critical thinking skills and improve their decision making under critical conditions. It gives our students an immersive training experience unlike any other." "When I first saw a demonstration of the canine patient simulator at Stanbridge College last fall, I was in awe," said Dr. Peter Weinstein, D.V.M, Executive Director of the Southern California Veterinary Medical Association. "Stanbridge has a precedence for using the latest training technology to aid its students. I never expected to see such innovative technology as this for their Veterinary Technology program. This new canine simulator is an example of the efforts Stanbridge College has made to make their training state-of-the-art. I fully envision that the combination of training with the canine patient simulator and hands-on learning will prepare these students for life in practice at a level not previously seen." With a Ph.D. in Bioengineering and Doctorate in Veterinary Medicine, Dr. Fletcher designed the manikin to allow veterinary and veterinary technology students to practice making clinical decisions in a safe environment. The manikin replicates scenarios including respiratory constriction, airway obstruction, and functions that could occur during anesthesia such as changes in oxygen levels, blood pressure, and respiratory rate. These changes trigger real-time alarms and reactions for students to troubleshoot through CPR and other skills. The simulator collects data from the students' responses to help evaluate student performance. Stanbridge College launched its Associate of Science in Veterinary Technology degree program, the first in Orange County, in 2013. The program prepares students for licensure to work under the supervision of a veterinarian in animal hospitals, shelters, research, or zoos. In addition to a fully functional Surgical Suite, X-ray Suite, and examination skills lab on campus, Veterinary Technician students train in shelters and clinics around Orange County. Under the guidance of licensed professionals, students learn proper and safe techniques with live small, large, and exotic animals. Stanbridge College is based in Irvine, CA with an annual enrollment of over 1,200 students. Founded in 1996, Stanbridge is nationally accredited by the Accrediting Commission of Career Schools and Colleges (ACCSC). Stanbridge College offers Master, Bachelor, and Associate of Science degrees and diploma programs in Nursing, Allied Health and Information Technology. In 2013, Stanbridge College received the Accrediting Commission of Career Schools and Colleges (ACCSC) Community Service Award for outstanding outreach to its local and global community. For each year from 2009 through 2014, Stanbridge has been named to the President's Higher Education Community Service Honor Roll, the highest federal recognition a college or university can receive for its commitment to volunteering, service-learning, and civic engagement. Stanbridge College received an award from Institutional Research & Evaluation, Inc., as one of America's Best Technical Colleges for each year from 2009 through 2014. From 2013-2014, Stanbridge College OTA graduates achieved a 96% NBCOT-COTA average annual pass rate. From 2007-2014, its Vocational Nursing graduates have achieved a 91% NCLEX-PN average annual pass rate and in 2014, its Hemodialysis Technician students achieved a 97% CDC CHT exam pass rate. For more information, please visit www.stanbridge.edu or call (949) 794-9090. The world's first high-fidelity canine patient training simulator at the Stanbridge College Veterinary Technology Skills Lab.